It has been said by more experienced people than I that "the ideal solution in bonding is seldom possible". Even with the best of care by the designer, working to co-ordinating sizes, houses never work out with the walls and openings finishing without using odd sized bricks. This is what closures are for. The sketch at the right shows the ones that have names. They are are used at the end of walls or at reveals, (window and door openings) and often over the top and below the openings. 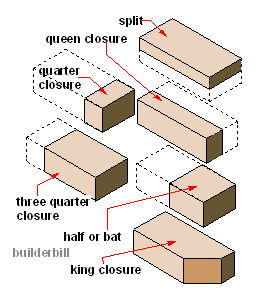 Small closures are NEVER placed right at the end of a wall. The are usually set in a full brick. 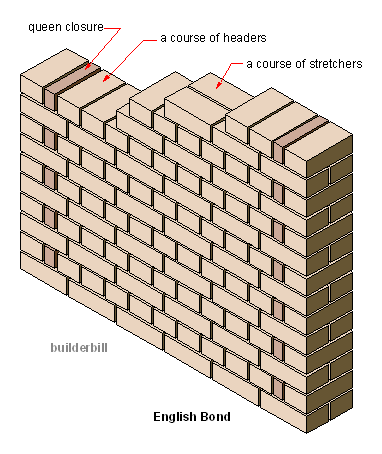 If there is a need to insert a change in the bond because of an odd wall length, many times this can be done over a door head, using less bricks than say at the end of a wall. 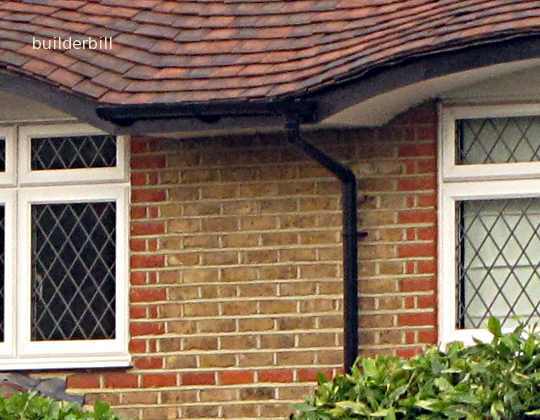 In the photo above the designer has chosen to add the queen closures to the dark red in the scheme and to keep this consistent around the house. This section would have normally used a three-quarter closure at every second course instead of the half and quarter.